Demand for medical and dental adhesives and sealants in the US is forecast to rise 5.1 percent annually to $2.1 billion in 2019, driven mainly by an aging population. Internal medical uses will remain the dominant and fastest growing application. The larger natural product segment will continue to outpace synthetic types. 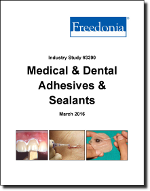 This study analyzes the $1.7 billion US market for medical adhesives and sealants. It presents historical demand data (2004, 2009 and 2014) and forecasts for 2019 and 2024 by product (e.g., collagen, fibrin, acrylic, cyanoacrylate, polyethylene glycol, silicone), application (e.g., internal medical, external medical, dental), and market (primary care, dental offices, consumer). The study also considers market environment factors, details industry structure, evaluates company market share, and profiles 25 industry competitors, including Baxter International, Stryker, and Pfizer.